Last year I made some drastic plans to change-up our gardens as a way to reduce the workload while still growing our entire year’s food. I pretty much stuck to that plan of just planting half of each outside garden space to make a true 50% reduction. Basically it was a sound idea, resulting in a decreased workload and about the correct proportions of various vegetables for fresh eating, and preserving for the winter months. Over the course of the season I discovered it can use some tweaking. We’re proceeding this year with about the same expected harvest outcome, but in a different configuration to lessen the workload a bit more. I’ll be dropping some crops or changing the amounts of what we grow for other reasons too. My practice of over-wintering root crops in the soil has come back to bite me big time via insect pressure, namely the dreaded carrot rust fly. In years past we had been able to avoid the pesky critters by timing our plantings to avoid the biggest hatch times. But a couple of mild winters and we now have a full-blown population of carrot rust flies. Last year was the first time in many years I didn’t plant any carrots, parsnips or beets for the house cow, or to hold over for seed saving. My goal was to not provide the carrot rust fly a leg up by providing winter feed and habitat for them. House cow roots for winter may become a thing of the past here, unless we decide to build a very large root cellar or a walk-in cooler for winter storage. I don’t really see that happening for such a low value home-raised input. We had the hardest winter in a long time and Jane came through in very good shape with not so much as one root vegetable. Weather is playing a role too in our garden plan changes. Two successive springs and summers of warm and very dry weather lulled me into thinking I actually lived further down in the valley and could grow marginal crops outside. Crop failure is a way of life if you garden or farm, but it is still a little (okay a lot) disheartening to have crop failure. Last summer was cool, closer to our normal summers of yore, but you have no way of knowing that when you gamble on seed or plant stock purchases. Live and learn, I wasted money on sweet potato starts, and tried to replicate previous successes with C. moschata squashes outside. Huge failure. Especially when you consider that I was so confident about growing those two crops outside that I failed to utilize greenhouse space that I had open. What was I thinking? I spoke about re-configuring our outside growing space in an earlier paragraph, I will still be planting half of my outside space, but to lessen wear and tear on me I am going to spread out my plantings to allow for more mechanical means of weeding. More specifically I will be tilling between my planted rows instead of hoeing. I know, I can hear the gasp now. Tilling!! I know all the arguments for and against. And I know my soil and my own limitations. I am nothing if not practical. It is not practical for me to deep mulch, build raised beds, hugelkultur etc. It is practical to use equipment I have, and cultivate my soil to grow our food. I know many people who do use the alternative methods, and while it satisfies their conscience to garden that way, I know (because they tell me) that they do not grow enough food to take them through the winter. They instead rely on the store or possibly a winter CSA (that all utilize conventional cultivation methods). So really, it comes down to the old NIMBY thing. In our area it’s usually people bitching about commercial logging while living in their wooden houses, sort of hypocritical don’t you think? It makes no sense to me to complain about tillage and then support that very thing by voting with your dollars. Keeping with the practical theme here too, I will be doing this tilling with my tractor instead of spending thousands on a walk-behind tractor. Not that I don’t want one, but it is sort of redundant for eighteen less inches of tiller width. Make it do, or do without. And like any gardening year, this will be an experiment. Wide fallow areas between rows may not work, but I won’t know until I try it. At this point I am more interested in continuing to garden on a somewhat large-scale as I age and finding the best way to do so. Growing up, Dad spaced all the row crops to fit the cultivators on his old John Deere tractor. That garden fed us and have the neighbors, too. Anything that saves time, knees, wrists and shoulders is a good thing. Being an eminently practical sort, I’m with you all the way on the do-what-works method, Nita! Schizophrenic systems are a way of life around here. In my kitchen garden, I have raised beds and don’t till. I started using the harvest/lay compost/replant method popularized by Paul and Elizabeth Kaiser about a year ago, and for that garden, it works great. With this method, I can direct seed cool season stuff way before I would ever be able to turn over soil. The big garden has to wait until it’s fairly dry – usually about May. The kitchen garden is where I grow salad crops and small amounts of things that need daily attention or harvesting, like snow peas, cucumbers and summer squash. The big garden (which is about six times the size of the kitchen garden) is tilled, and we use cover crops and sheet composting there. The big garden is for the mainstay crops like beans, tomatoes and potatoes, and space-eating crops like corn, winter squash and pumpkins. Kitchen garden gets a daily or twice daily watering with a hand-held hose spray nozzle ala John Jeavons’ bio-intensive methods, because the house well won’t stand up to more than that, especially in the late summer when the spring that feeds the well takes longer to recharge. Big garden is flood irrigated (gravity feed, no pumps) with the same system we use for our pastures. Kitchen garden gets chicken litter; big garden gets horse and cow manure. The other factor is that the big garden is where I have more ground squirrel problems, so it’s a regular hunting ground/target practice area for hubby and the oldest granddaughter. Different conditions and needs, different systems. I hear you all counts Bee, if I didn’t have the greenhouses for an early start, I would definitely be using Singing Frogs methods. I watched their NOFA talk this morning. Most definitely using more occultation with silage tarps for ground prep, and landscape fabric in the greenhouses this year to keep the jungle beat back, but also in combination with more inter-cropping like I used to do before I started using the plastic mulch. I knew when I finished my thin plastic mulch rolls I wouldn’t buy anymore. WIP for sure. We have so much wild or perennial covered space (like 99.9%)I just won’t take a beating for keeping my garden carved out. Right – I think there’s a big difference between tilling a 5,600 square-foot garden (the big garden) and thousands of acres. It’s the latter that does so much damage to the land, and goes back to the idea of centralized growing (get big or get out) and then shipping stuff all over the country/world. Much better to have small, decentralized farms and local food as much as possible. 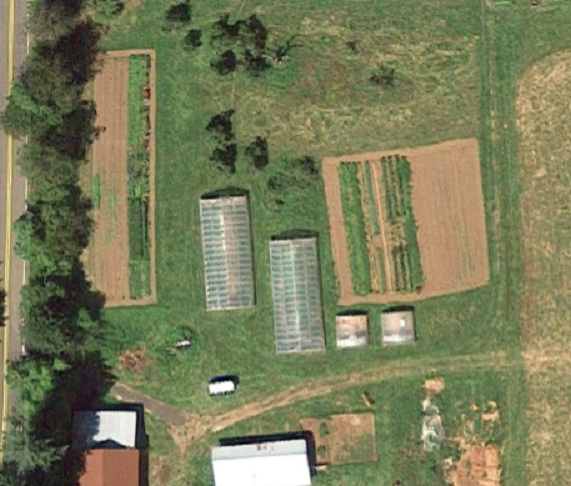 I’ve seen too many examples of how well the small farms can feed even large populations. Think China, Russia, the Paris market gardeners, American victory gardens in WWII – did you know that the victory gardens equaled the production of commercial fruits and vegetables? Like you, we’ve got mostly wild/perennial growth on our 185 acres (actually I could do with a little less of some it, like the poison oak and wild blackberries! ), so the area I’m tilling is a drop in the bucket. The only fly in my ointment is that in order to have it close to the water source, the big garden has to be about half a mile from the house. Hey, on a completely different note – Ed went up to Cedarville last weekend (NE corner of the state) to hunt and found a puzzle. The cows belonging to the ranch owner are dying – they find them dead in the field with no previous signs of illness, most lying down in the typical sleeping position, no signs of struggle, no bloat. The hair starts to slip within a couple of hours of death, in huge patches, and the skin is deep red. They’re all in different pastures, different ages. They’ve lost at least 60 head in the last couple of months. Can you think of anything that might cause those kinds of symptoms? I’m stumped. Any ideas gratefully appreciated. Thanks! I’m thinking maybe Prussic acid poisoning from frosted grass or it can also happen with lush growth. I think this happened in TX a few years back after a drought then rain period. Just my guess though, not really sure. That’s awful! What a fabulous gift you are to everyone who stives with the earth to sustain themselves or it. I’m now at the point in my life where the doc’s are starting to say those three little words, .. “At your age”.. Indeed, a very hard pill to swallow. I read this post with great interest, knowing change needs to happen. One question I do have is about the idea of growing year round in lieu of doing less canning. Is that something you are still pursuing? Karen, I seem to keep hearing the same thing! Yes, I am still trying to grow year round more, and I hardly canned anything last year except applesauce and tomato products. We had a terrible winter (for us) and a lot of my over-wintering plants froze out making me glad that I had frozen some surplus during the summer months and made more kraut type of products. It really helps even out the harvest work to not can as much. Freezing so much faster. Yes. I’m always so glad in the winter months that I took the time to squirrel away a bit of this and that. Ya never know. Appreciate hearing your thoughts. And here we are, expanding as fast as we can. Jade’s putting in 2 more large beds, and we are adding bees at some point. I’ve got 3 seed trays and some assorted stuff started, with 2 more to start today. And we are still in a half foot of snow, with more coming down. More tomatoes pumpkins etc getting going today! I want berry plants this year, but I am not sure it will happen. A LOT of new chickens. And turkeys, and ducks. And still snowing! Up to 5 inches expected Fri-Sun. Shoot me now and get it over with! Turkeys are hatching as I type. 6 out fluffy and dry, 3 more and hopefully the 3 duck eggs. Not impressed with my duck fertility/development. Put P-nut down for a nap, now about to do some research on boosting virility and embryo health in ducks. I’ve about given up on spring ever arriving, it has rained her almost 60 days straight. Good luck with the hatching!! I’m hearing you on all counts though I’m still trying to expand my garden to accommodate more things that will survive our climate – as opposed to trying to grow things that need an inordinate amount of attention/water/shelter etc. I haven’t grown a tomato in three years now – it’s far less grief if I just purchase locally and can what I need, as opposed to crowding out my small greenhouse, pruning like mad, bucketing water, wrapping the green ones – so I can still be short of tomatos. Live and learn. Less abuse to the body is a fabulous plan too. Your tomatoes sound like our strawberries. I beat myself up following old advice with the matted row, June-bearing types, always weedy and way too many berries to deal with at one time if I could keep the deer out of them. So frustrating, and we would end up buying berries 😦 Finally I figured out the plastic mulch, day-neutral berry thing and I treat them like annuals. It is cheaper for me to buy new disease free plants each year, and replant than it is to buy a couple of crates of berries, and they have a devoted row in the high tunnel. Now we have berries from May to frost instead of a perennial weed patch. I love how you explain why you do things and what you’ve considered. I think it comes down to knowing your climate and what you can grow when/how. That hugelkulture stuff must work in some situations, but I don’t know if its any good where I garden. I could not do without mulch though, the soil would dry out. Interested to read your thoughts again at the end of the growing season. Oh my. No beets? The horror!! I hate having, no beets. That, and kale, are my two favourite vegetables. But I understand the reasoning. Just curious, was that photo of your farm taken with a drone? What a neat way to keep track of what your farm/land looks like over time. Hello. Excellent article. I would point or something though. I used to till with a 4wheel tractor and a heavy roto-tiller. This has three problems that made me change. One, it uses an incredible amount of fuel. Two, it is very heavy and worsens any compaction issues you may be having. Three, it just doesn’t do a good job. A good 2wheel tractor and a rotary plow, while slower, do such a better job, and with a fraction the fuel cost or compaction, that I can wholeheartedly say go for it and don’t look back. It’s easy to sell stuff on craigslist. Also, while I don’t mulch everything. I’ve found growing a hayfield of red clover to use simply as mulch is effective and cheap. About twice the size of the garden does the job. Then rotate the garden into the declining hayfield terminated with a rotary plow. Works especially well with curcubrits. Thanks for sharing your experience and pointing out the NIMBY issue. One thing though with your plan that doesn’t fit mine, is I don’t believe in “declining” hayfields…I have livestock and I need my hayfields/pasture to be productive. I can’t really get rid of my tractor, I need it for other things a two wheel tractor can’t do. I’m wondering about heavy fuel usage though? I don’t use more than 5 gallons of gas per year for tillage if even that. Does that seem excessive to you? Thanks for the ideas. I do not know exactly where you are, but hope you safe from the fires. We may be getting house guest(s) from the Corbett area. Hope for rain. Stay safe. I live in suburbia and have tasted crop failure. i ended up with an epidemic of slugs, snails and slaters that was turning my vegetable garden into a nightmare. I have just started my journey towards a self-sufficient lifestyle and enjoyed reading your post. I am following your site and look forward to your future posts. Thank you. Happy New Year, 2018. Know you like INSTAGRAM. I read you there and enjoy. Really do miss all your postings here. Learned so much. Could we have a new ( I know) a short posting and a new picture. Maybe scenery or of the cattle, etc. Very long time reader in Northern, CA.